When your child forgets to take his shoes off before heading into the moonwalk or you accidentally puncture it when moving it, you need a quick fix. The Moonwalk Patch Kit can easily fix small holes and tears in your inflatables, but it's not designed for larger tears. 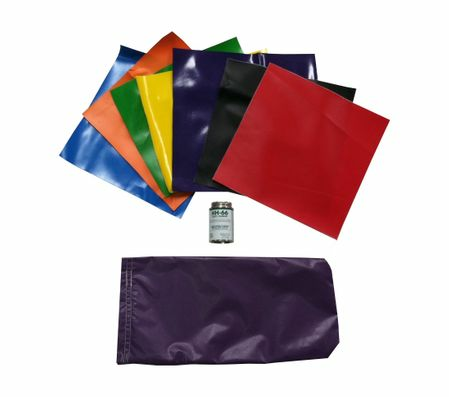 The inflatable patch kit contains 8 vinyl patches and a 4-ounce can of cement glue. All you have to do is find the hole, glue the patch and wait for it to dry. If you want extras like rainbow netting or black mesh, but don't want to purchase an entire inflatable repair kit, then you can add them directly from this page. It's a good idea to have a few of these on hand to take care of any problems that arise. You never know when a puncture will take an inflatable out of commission, but our moonwalk patch kit will get it up and running.